Garbo has been less shy of the press in her own country. Here in 1935, she is seen on board the Kungsholm approaching Gothemburg, on her third visit to Sweden. Garbo gives short answers to all questions. Mostly she says “nothing“ or “no“, according to the newspaper reports of her arrival. But she definitely makes an intelligent impression, a reporter adds. 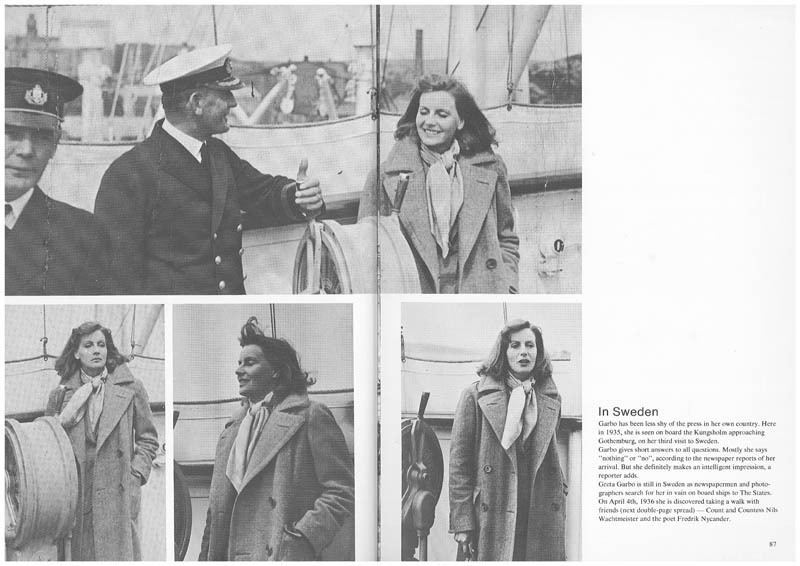 Greta Garbo is still in Sweden as newspapermen and photographers search for her in vain on board ships to The States. On April 4th, 1936 she is discovered taking a walk with friends (next double-page spread) – Count and Countess Nils Wachtmeister and the poet Fredrik Nycander.